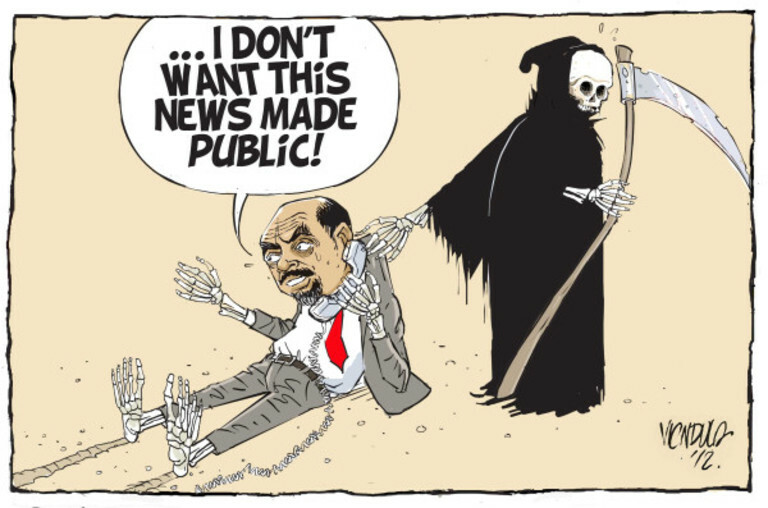 August 8, 2012 — Ethiopian dictator Meles Zenawi is said to be terminally ill from blood cancer and his days as the Prime Minister are over, according to a source with connections to the secretive Ethiopian National Security and Intelliegence Serivce. "Meles is suffering from blood cancer and his prognosis looks grim. Belgian doctors are trying radical treatments to reverse his terminal status. One thing is certain though: his days of being a Prime Minister are finished", said our contact by phone, who declined to be named for fear of reprisals. 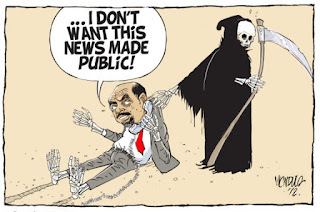 Meles, who has been absent for 48 days to date, has been in power over Ethiopia for 21 years through a tightly controlled ethnic-based oligarchy. Many regional observers believe his sudden departure would throw the ruling TPLF regime into chaos as his colleagues vie for control. During a presser last week, Bereket Simon, a government spokesperson, said to state media that Meles was on a 'holiday'. He later changed his story and said he was 'recuperating' from an unspecified aliment but declined to give a timetable of his return. Amid the premier's absence, Seyoum Mesfin, Ethiopia's Ambassador to China and longtime friend of Meles, has increasingly been taking a leadership role. Last Friday, he ordered Al-Jazeera website and channel blocked from Ethiopia, after the Doha-based network aired a debate about the country's current crises. Meanwhile, authorities continue to crack down on news agencies who report of Meles' deteriorating health status in the country. Last week, police brought eight charges against the Editor-in-Chief of Feteh, Temsegen Desalegn, for articles published in seven editions of the newspaper.